Cheryl Bromley is trying to become the Tiger Woods of golf croquet. She's off to England to represent the U.S. at the British Open later this month. It is not one of those lesser-known sports like curling or synchronized swimming that automatically inspires a corny punch line. "It brings a smile to everyone's face because everyone seems to have played it in their backyards," Cheryl Bromley said. That is not to say, however, that the former college basketball and tennis player and intense competitor imagined she would one day be traveling the world toting a croquet mallet. Or at age 52, be considered the best women's golf croquet player in the U.S.
"This was really out of the blue, it really was," said Bromley, the tennis director at the Hillsboro Club in Hillsboro Beach, Fla., who began playing the sport after being asked to help organize a croquet tournament . "I thought maybe I'd start playing when I was older. Then I thought, 'No, I want to play now so when I'm older, I'll be awesome.' "
The U.S. Croquet Association has approximately 3,100 members and estimates about 10,000 Americans play croquet on a regular basis. But that does not include the 100,000 croquet sets they estimate are sold per year in U.S. sporting goods stores for those, according to USCA president and Hall of Famer Johnny Mitchell, "who play on Fourth of July weekend, at grandma's house and who have no idea there is this competitive game out there, a whole other version of it." Backyard croquet is the closest approximation to what is referred to as Nine-wicket. There is also the international version called Association croquet, American Six-wicket and golf croquet, the version that captured Bromley's attention six years ago. "It's a lot faster," Bromley says of the game in which the ball can travel at speeds in excess of 55 miles per hour. "You can easily break an ankle out there. There's more shot-making, and it can be really exciting for spectators." 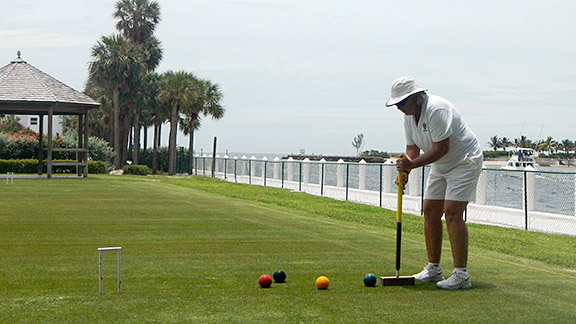 John Osborn, a three-time national singles croquet champion whose father Jack formed the USCA and developed the game of American Six-wicket croquet, calls golf croquet the easiest version to learn and agreed with Bromley that it can be the most entertaining to watch. "If you look at a tee time group for a minute, it looks cute," he said. "But when you watch on the professional level, it's a phenomenal game that requires touch, power and cunning more than anything else, and experience goes a long way." Bromley, who will represent the U.S. at the British Open in Budleigh, England, from June 20-23, said she first became fascinated with the sport when she realized the inherent benefits. "Sports and competition is in my blood, so I went down there and suddenly a light went on," she said. "Some of our members were great athletes in their day but were aging. But there they were, with another sport you can keep competing in until you die. "I know tennis is a sport for a lifetime but you slow down, have injuries. But in croquet, instead of deteriorating, you excel. So I was really intrigued." Bromley soon became certified to referee in order to better understand the sport but what she learned immediately and what captivated her most was the even playing field across gender and age differences. "I can play against a 14-year-old boy, an 85-year-old woman or a 60-year-old man," she said. "You would not believe how accurate and how honed a person's form can be from playing for the last 20 years," Bromley said. "I played an 82-year-old woman once, and I'm going 'Really?' But she taught me a good lesson about underestimating your opponent. An 85-year-old can be an amazing shot-maker." Bromley, who avidly promotes the sport and is trying to develop a golf croquet pro circuit in the U.S., jokes that she talks so incessantly about croquet that she has dragged her friends into it. She also encouraged her husband Bill to get involved two years after she began, and he picked it up quickly as well, being selected by the USCA to compete in April at the world championships in Cairo, where croquet is played at the highest level. But for now, Bromley is the rising star, having finished fifth at the North Yorkshire Women's Open in Ripon, England, last summer while competing against eight players who had been in the world championships in New Zealand in 2011. Bromley also finished second in March at the National Croquet Center's annual tournament, and Osborn, also a tournament director and instructor who has worked with her, marveled at her "amazing improvement year to year." "Golf croquet is like golf in the sense that you can go out with a 26 handicap and have great fun every week, or try to become Tiger Woods," he said. "Cheryl is trying to become the Tiger Woods of golf croquet."